THEME: Reflections on kids with Down's Syndrome. Are they any less precious? I remember a time speaking with a friend about his wife being asked to do an amnio. According to many medical experts, once a woman over the age of 35 gets pregnant, the routine advice is to undergo the test. The main purpose in doing an Amniotic fluid test is to check for any abnormalities in the chromosomes, in particular, the detection of Down's Syndrome. My friend makes a committed statement that he is not going to let his wife do it. "So what? If the tests reveal a Down's Syndrome baby, are we going to abort? If it is no, then why do the test?" I like his conviction. He is one of those brothers in Christ I have that says, believes, and acts at the same beat. We need more of such people. In many parts of the world, both rich and poor, the pattern is to prefer the good and despise the not-so-good. Like selecting Fuji apples in the grocery store, we pick and choose only the crunchiest and nicest looking fruit. The slightest defect merits a toss to the side. Only the best gets selected. While this is quite understandable for a little fruit, what if the attitude extends to the human domain? "Prodigy kid is the youngest to get his PhD." "Top student fails to get a scholarship." "A New Millionaire has risen from the slums." "Prettiest girl comes from humble village." This can also be called 'elitism,' that only the top, the richest, the best gets royal treatment. I think to myself, "You mean the average, the ordinary, and the lesser student is of less worth? What happened to the everybody-is-equal belief"
As a result, there is an unwritten disdain for the poor, the weak, the unknown. This widely circulated picture on the Internet on the right tops it off when painting the overall shape of cultural sentiment. After the outpouring of emotions at the death of a technology icon recently, the world reacts in shock and disbelief. All of a sudden, the everyone is talking about how the world has lost a charming inventor. People value the Apple icon and inventions more. One wonders why the difference in reactions? With the ongoing poverty and hunger conveniently forgotten, one wonders if they are any less important. Something is very wrong. 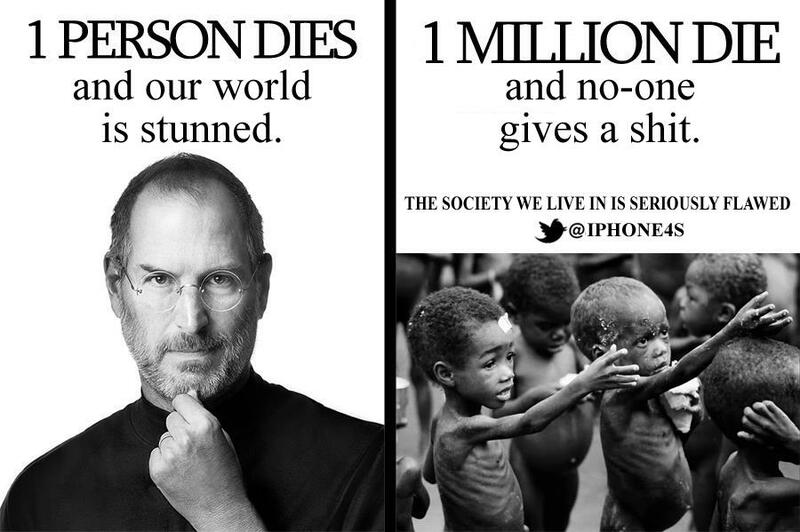 Our world is a messed up world. We treat human beings like apples. Worse, we may unwittingly assume that the messed up world is a norm that cannot be changed. A messed-up thinking can also infect the way we treat children. It is a common prayer request for Christians that their child will turn out 'normal.' What if the child turns out different? What if they have something extra? What if they have an additional chromosome, that labels them a Down's syndrome kid? Will that chromosome reduce them as a real person? I hope not. Are we more afraid of how the child will survive in this world, or are we more afraid of the stares public eyes will throw at us when we walk our child out in the streets? Probably, both. When Amy Julia Becker learns of little Penny inside her having an extra chromosome, her emotions turn into a state of turmoil. The amnio tests reveal that Penny is most likely to be a Down's Syndrome kid. Her theological training only makes it worse. Further tests only reveal the hard truth. It is not just Penny but a "Penny has Down's Syndrome" feeling that dominates. For anyone whose child has an abnormal medical condition, it is tempting to become fixated on the problem, that the person is missed out. I often hear Luke 9:48 being spoken about at Communions, at Sunday School children dedications, baby shower celebrations, and so on. While that is good, what about letting Luke 9:48 maneuver a little deeper and a lot wider to include ALL children? Whether a child is sick or not, a child is a child. Whether a child scores straight A's or all F's, a child is a child. Whether there is an extra chromosome or not, a child is a child. The words of Jesus is plain and clear. The journey to receiving a little child is long. We need help. We need companions. When the Beckers learn about Penny's Down Syndrome condition, they begin to appreciate the openness and warmth extended to them by counseling groups, self-help organizations, and well meaning words of support. They learn to learn to forgive others of insensitive advice, and to be thankful for the loving counsel from some wise friends. Most importantly, the spousal support is key. Amy recalls her husband, Peter's words. When we embrace the child we have, just as they are, no one is going to take away the privilege of celebrating the highest highs, and enduring the lowest lows. For whatever condition is the child in, love can still be given. Key Note: Jesus' primary reason when coming to earth is not to solve problems but to SAVE people. While we are called to pray for all children, may I ask that we specially pray for those raising up children with Down's syndrome or other 'abnormalities.' These parents and children are the ones who have to endure insensitive stares whenever they venture into public places. They have to tolerate weird advice too by people who mean well but communicate terribly. Pray for wisdom to love the child regardless. Encourage them, just like this friend has encouraged Amy in an email that says simply: "I can't wait to see the ministry that Penny will have." Only time will heal. Wise counsel will help. My challenge to you my reader is this. Let the beauty of God's love stack higher than the ugliness of sin. If you believe in God, believe that He can cause all things to work out for good, in His perfect time, no matter how difficult or impossible it may seem. The presence of an additional chromosome does not mean the end of the world, but the beginning of a special journey. It is a journey to enlarge our heart of love. Once we are able to love our children just as they are, we will be better equipped to love others just as they are. Let us never call any child, 'retarded.' Jesus will never look at the child and say: "You're retarded," and then hurries to the next activity on his itinerary. Instead, he gazes lovingly at any child to say, "I loved you so much that I died for you too."